You can’t feel cool playing with one of those ‘push the block through the right-shaped hole’ games they give babies, so it’s tough to feel it while playing Roogoo. True, it’s more demanding: expecting you to spin the discs to the right holes at increasingly fast speeds, it mixes it up a bit with monsters to smash, butterflies, and more holes than a Swiss cheese in a gunfight. 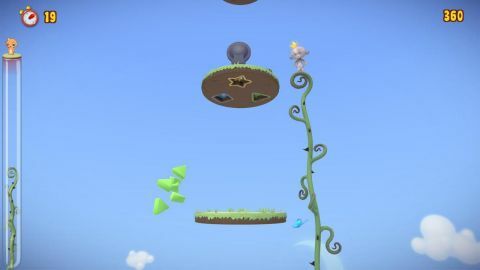 The challenge comes from fast reactions rather than puzzle solving and tactics, especially when you factor-in the constantly switching levels and falling blocks trying to play havoc with your depth perception. It works, but finishing a stage tends to come as a blessed relief rather than something that makes you welcome the next challenge. Description Though you may not feel mature playing a game of placing blocks in the right hole, this unique puzzler is fun for the brave.